Squash season is officially here. As you read through the delicious recipes and ingredient substitutions that involve winter squash, why not choose the best types for your kidney diet? 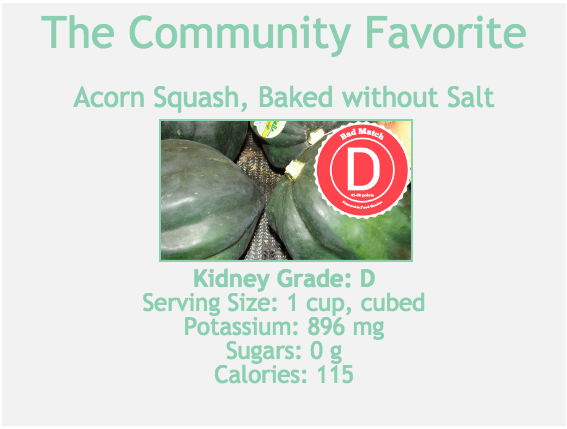 Acorn Squash topped our search engine list last week. Perhaps it is such a popular addition to rich sauces and pan-fried veggies because its sweet flavor offers a subtle contrast to those sometimes bitter foods. Yet, 1 serving (1 cup, chopped) would contribute nearly half of your daily potassium intake- not ideal for someone on a low-potassium kidney diet of about 2000 mg per day. Meanwhile, 1 serving (1 cup) of Spaghetti Squash qualifies as a low-potassium food, delivering less than 10% of that daily potassium limit. The next time you see an irresistible acorn squash recipe, try turning it into a more kidney-friendly faux pasta dish by subbing spaghetti squash for its higher-potassium cousin. Find more nutrition facts and other simple substitutes on Prenovate's Food-Grading Engine. Fall is here! Like clockwork, the usual bevy of sweet potato- or pumpkin-flavored food products will appear on our grocery shelves. And, many of these products will actually feature pumpkin or sweet potato as ingredients. Let's compare these two autumn classics to help you make the best eating decisions for your kidney diet. The choice between Sweet Potatoes and Pumpkins is relatively simple when you compare the numbers. One cup of boiled Sweet Potatoes earns a much lower grade than the same serving of Pumpkin, largely thanks to the 200% higher content of sugar and potassium in sweet potatoes. Even if your kidney diet doesn't yet restrict potassium, pumpkin is a better choice because of its lower sugar content. With all the talk about performance-enhancing drug use in the Olympics, we thought we'd explore a different type of cheating: eating junk food. You read right- we're going to show you how to have the most awesome cheat day ever...and still not break your kidney diet. Pizza is always fairly high in our Food-Grading Engine searches. So, we compared a Domino's Pepperoni Deep Dish Crust pizza to a regular Domino's Cheese Hand-Tossed Crust. The Cheese hand-tossed pizza won by a head, and it's easy to see why. It's so much lower in three of the main nutrients you need to limit with kidney disease: sodium, potassium and protein. 1) Adding meat means more salt (sodium) and protein. 1 slice of deep dish pizza contains about 60% of your daily sodium limit. 1 slice of the cheese pizza is closer to 30%. 2) Adding more bread, cheese and tomato sauce (in a deep dish pizza) means more potassium. Who doesn't like comfort food? Making simple tweaks to your cheat meal will let you indulge without falling short of your daily kidney goals. For more nutrition facts and other simple substitutes onPrenovate's Food-Grading Engine. With the Olympics underway, we can't help but notice the athlete-themed designs lining our breakfast cereal aisle. Like the classic Wheaties slogan, we want to help you find your "Breakfast of Champions"- one that is both nutritious and follows your chronic kidney disease diet. So, we compared to quick breakfast classics: oatmeal and a bagel. Here's what we found. While Quaker Instant Oatmeal (with peaches) sounds like a healthy treat with oats and fruit, you might want to think again. Its oats are higher in potassium- taking you 20% closer to your daily potassium limit if you follow a strict potassium diet. As if that weren't enough, this quick meal features much more sodium and more free sugar (from peaches and peach syrup) which could be rough on your kidney diet and diabetic diet, respectively. A small Oat Bran bagel, on the other hand, has much less potassium, sodium and sugar. Of course, this fried treat does contain more saturated fat than oatmeal...balance is the name of the game. Check out the nutrition facts and other simple substitutes onPrenovate's Food-Grading Engine. Happy Thursday, Prenovaters. 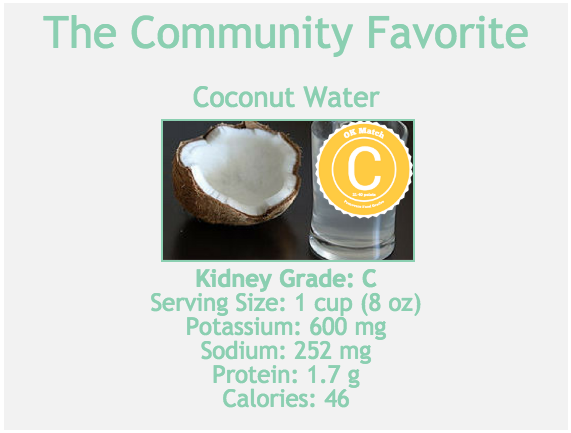 Coconut Water is all the rage this summer- both on internet search results and in the Prenovate Food-Grading Engine. This refreshing juice poured from whole coconuts is lauded for its low-sugar and high-vitamin content. However, the same high potassium levels that make coconut water a healthful part of a general diet also make it a potential no-no for the strict renal diet. If your doctors and dietitians have told you to limit your potassium intake, you might want to fall back on an old faithful: Apple Juice. Although apples don't have the exotic reputation that coconuts have in North America, your kidneys will thank you for their lower potassium and sodium levels. Check out the nutrition facts and other simple substitutes on Prenovate's Food-Grading Engine. Good Job! You're on our list.